The Blue Ribband and the Hales trophy attempt. 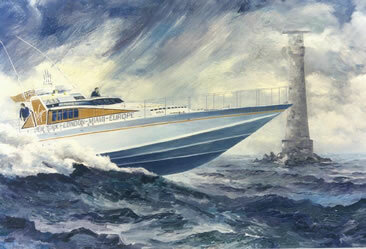 Marine art by Gordon Frickers 61 x 91 cms (24″ x 36″), oils on board, original sold to Sir Richard Branson. Available as a sighed numbered ‘Heritage’ print. The fastest Atlantic crossing record was broken by Richard Branson and his Virgin team from the Ambrose light, New York to the Wolf Rock lighthouse, Isles of Scilly run. In the year 1933, Geoffrey Hales commissioned and donated a trophy. This trophy was denied to Richard Branson and his Virgin Atlantic Challenge 2 team.